The details around planted memories were particularly fascinating to observe as a support group develops a hysteria worthy of the Salem witch trials, one that accuses childhood family and friends of sexual abuse. And once that group reaches a frenzy, their leader is suddenly murdered. Who is telling the truth when they aren't even sure themselves? 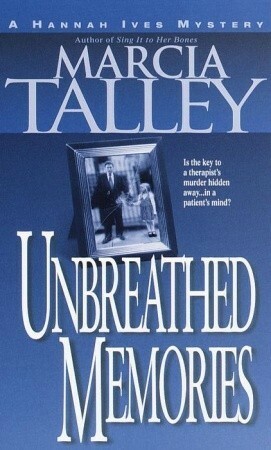 Another easy read by Talley. Not much challenge here but enjoyable. I maintain my perspective that it's almost a grown-up's Nancy Drew. Dated a bit because the series is long, but I didn't mind the flashback. Week 43 of the 2015 Reading Challenge: A New Author. Meaning an author I've never read. This was a book I had from a bag of random books from my mom. it was OK. nothing special about it! Quick easy reads. For when you just want an interesting mystery. Good local mystery writer and another series to follow. Hannah Ives! Marcia Talley - Marcia Talley is the Agatha and Anthony award-winning author of DEAD MAN DANCING and six previous mysteries featuring amateur sleuth, Hannah Ives who, like the author, is a breast cancer survivor. Marcia is author/editor of two star-studded collaborative novels, NAKED CAME THE PHOENIX and ID KILL FOR THAT set in a fashionable health spa and an exclusive gated community, respectively. Her short stories appear in more than a dozen collections including With Love, Marjorie Ann and Safety First, both Agatha award nominees, and the multi-award-winning Too Many Cooks, a humorous retelling of Shakespeares Macbeth from the viewpoint of the three witches. A recent story, Driven to Distraction won the Agatha Award, was nominated for an Anthony, and was reprinted in THE DANGEROUS BRIDE AND 21 OF THE YEARS FINEST CRIME AND MYSTERY STORIES.Marcia is immediate past president of the Chesapeake Chapter of Sisters in Crime, serves as Secretary for Sisters in Crime National, and is on the board of the Mid-Atlantic Chapter of the Mystery Writers of America. She divides her time between Annapolis, Maryland and an antique sailboat in the Bahamas. "